Now that we have Z into a school, we're thinking of buying a house and setting down some roots. We're not expecting to make this move for some time, though. There's the albatross of our beloved Chicago house. Even with all its sterling qualities, it will not sell at the peak price that we purchased it for. If only I could pick it up and bring it over to the west coast. It's not a huge house, but it was home for a few years and I have fond memories. Although we want to live near the school, it's in a fairly posh neighborhood, and housing prices are not compatible with our current situation. So we're tracking prices in adjacent neighborhoods, including the Parkside and Sunset. To tell the truth, I'm experiencing some ambivalence because I spent a good part of my childhood in these areas. I had always thought I'd never live in that area again, and to be looking at housing there is, well, weird. I never wanted to go home, so to speak. But there is some odd comfort in living in the same neighborhood: riding the N Judah, marveling at the stretch of Noriega that's become a micro Chinatown, going to Sunset Super (either location) for my comfort food cravings (fish balls...oh yeah), dim sum and roll cakes to go on Irving Street - and Yum Yum Fish is still there! 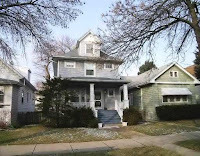 My feeling is that we'll rent a humble abode within walking distance (ideally) of school once we rent out the Chicago house and if we find something that works. Like most of the great things that have happened to me, it'll be by chance and very easy. And we can still go to the wonton house on Noriega for cheap, filling eats; the kids dig on the wonton noodle soup. journalists, and am ever so slightly impaired.